We are approximately 100 metres from the skibus stop, 800 metres from the highstreet. Parking spaces are available. Free wireless internet (WLAN) available. (Self–catering, bread roll delivery service possible). 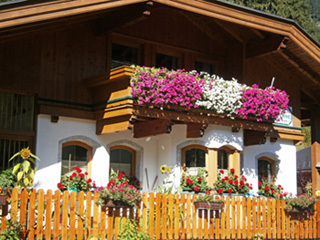 Our house is situated on the edge of Mayrhofen in a quiet location. Directly near the cycle and walking trails along the river Ziller, the forest walk paths, the start of the Zimmereben Klettersteig (Via Ferrata) and in winter the langlauf trail. We are approximately 100 metres from the skibus stop, 800 metres from the highstreet, 1.5 km from the Penkenbahn or Horbergbahn gondolas and 1.7 Km from the Ahornbahn. Ski storage and a ski boot dryer can be found in the cellar. Parking spaces are available. Free wireless internet (WLAN) available. The High Alpine Nature Park of the Zillertal Alps, a “Protected Area” on the main ridge of the Zillertal Alps (1,000-3,509 metres above sea level) encompassing 372 km², is full of stunning natural landscapes covering all altitude levels of the inner Alps – with around 80 glaciers, three enormous reservoirs as well as several mountain and corrie lakes. Even in the valley, the impressive natural surroundings provide the perfect environment for varied and unforgettable summer holidays, You”ll find it all; action, wellness, walking or adventure. With the Mayrhofen Ski Pass, there are 133 km of slopes with every degree of difficulty, 51 lifts and guaranteed snow up to 2,500m are available with one ticket. Enjoy the winter skiing or snowboarding on one of the largest network of ski slopes, or perhaps a winter walk on one of the cleared footpaths. There is also cross-country skiing or one of the “white” fun sports like snow tubing, skidoo, snow shoe trekking or downhill sledging. The pure and clear air in the winter landscape around Mayrhofen and Hippach is just as breathtaking on the mountain. This includes not only the unique views from the terraces of mountain huts and restaurants, but also the experience of paragliding. Simply try everything out – new types of sport, wellness, action skiing and partying, culinary delights and the feeling of just being on holiday!